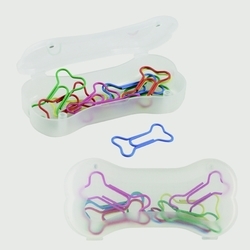 Bone Shaped Case includes 10 assorted colored dog bone shaped paper clips. Price includes a pad printed, 1-color imprint on case in one location. 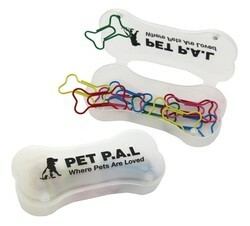 Size: 3-3/4" x 1-3/4" x 3/4". Imprint Area: 2-3/4" x 1/2". 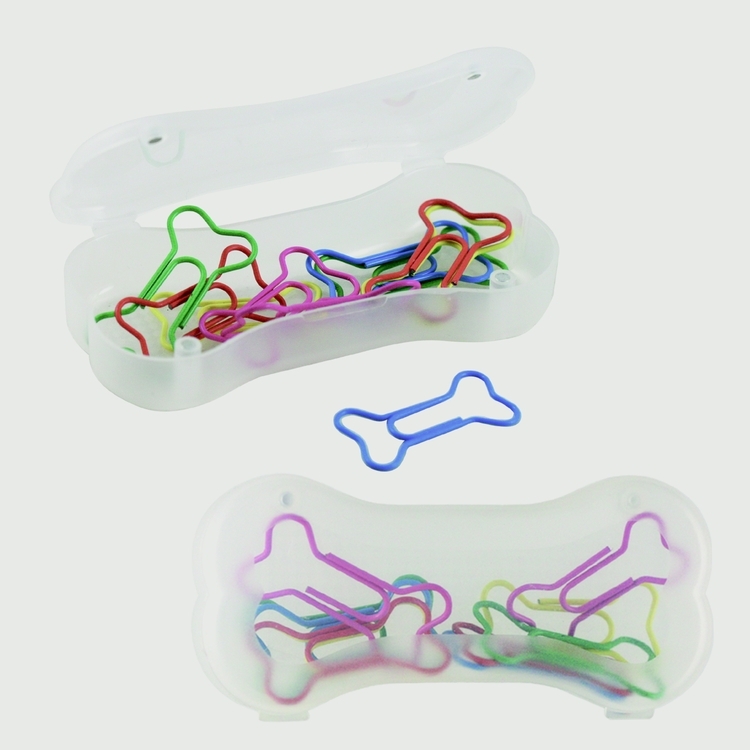 Product Color: Frosted case w/ assorted colored paper clips. Imprint Colors: Black, Silver (877), Gold (871), Process Blue, Reflex Blue, Violet C, Blue (072), Bright Yellow (108), Athletic Gold (123), Orange (165), Red (185), Maroon (202), Burgundy (208), Medium Pink (205), Dark Pink (215), Bright Pink (225), Royal (280), Columbia Blue (284), Blue (285), Blue (293), Blue (300), Teal (320), Dark Teal (327), Green (341), Green (347), Lime Green (361), Dark Gray (430), Bright Red (485), Red (1795), Purple (2577), Purple (2738), Dark Green (3435), Brown (4625). Additional Colors: $45(G) Set-up plus $.35(C) per piece. Exact repeat set-up is $25(G) plus $.35(C) per piece. Max. 2-color imprint. PMS® Color Match: $25(G) per color. PMS color match cannot be guaranteed. Packaging: Individually polybagged. 250 units = 16 lbs.